Hempstead church sits alone in the flat fields less than a mile from the bleak, caravan lined Eccles beach in north-east Norfolk. In winter, sea frets spread like smoke across the bare soil, the few trees drip with damp, and the occasional farmworker on a bike is the only movement in the ancient, narrow lanes. It might be any century. It seems impossible that we are less than 150 miles from central London. One winter's day in February 1982, someone came into St Andrew and used a screwdriver to remove one of the boards of the rood screen. It was an image of St Eligius, patron Saint of farriers, found once only elsewhere on a screen in East Anglia. He stands at his forge working on the leg he has miraculously removed from the no doubt astonished horse beside him. The panel has never been found. If thefts are ever going to happen in churches, this is exactly the kind of spot where they will occur, and so the poor old Church of England has to balance its responsibilities to be an open act of witness and to safeguard the nation's heritage. Today, St Andrew is kept locked, but they will gladly open up for you to take a look at what is simply one of the major art objects of England. For a start, it is very early, certainly no later than the end of the 14th century. The uneven top beam is completely unrestored; indeed, the whole piece has only been lightly touched since its original construction. But the the real significance of this screen comes from the quality of the painting. It is exquisite, and certainly on a par with Norfolk's best at Barton Turf. Indeed, if it were in better condition it would be as well known as the screen there. 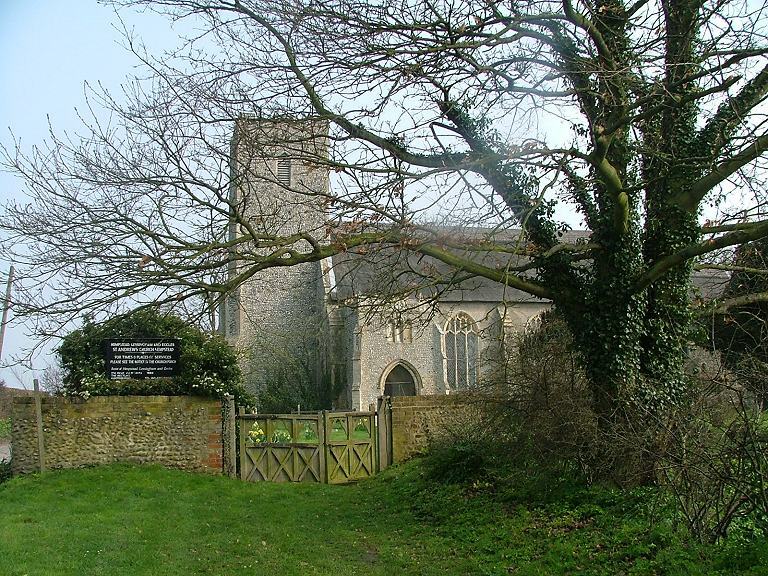 Norfolk's most famous is that at Ranworth, but the painting there is certainly not as fine as that here at Hempstead. 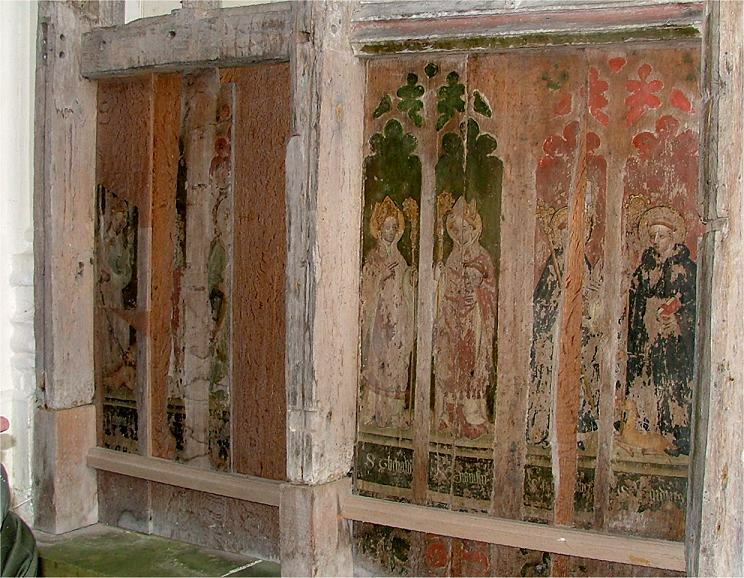 Tom, who has seen many more screens than me in both Norfolk and elsewhere, pointed out the superb quality of the panels featuring St Stephen and St Lawrence, and the use of that pale and radiant blue, fabulously expensive to produce and unique in his experience. The screen dado consists of two ranges of eight panels each, the panels arranged in pairs, some pairs significant, others apparently not so. You can see images of all of them below - click on them to enlarge the images. XVI: St Eligius, the stolen panel. The Hempstead screen - gloriously rustic, gloriously alive. Apart from its screen, Hempstead is not a remarkable church. It is as serene as its setting, a place where not a lot happens. The font is overwhelmed with damp, but this somehow makes it more organic, as if the whole place is comfortably blending into the fields. A couple of medieval angels look from a north window into the silence. Most curiously out of place, three massive baroque bench ends that came here from Kings College Chapel in Cambridge. A contrast with the homely hand-painted decalogue boards in the simple sanctuary, the handwritten roll of honour. Such a quiet place for this wonderful screen.